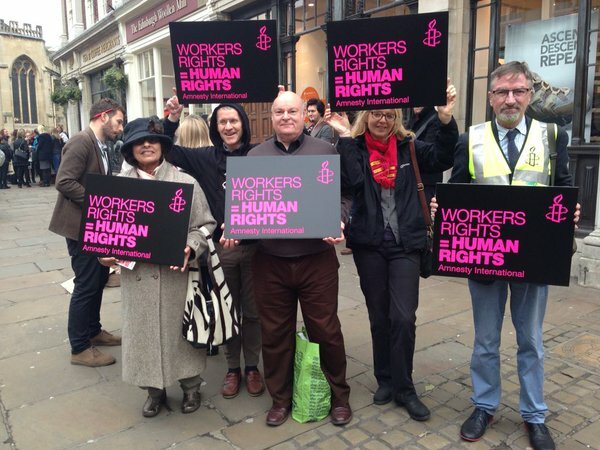 On Saturday 31 October, members of our group participated in a rally in St Helen's Square to protest against the government's proposed Trade Union Bill. Shane Enright (workers' rights campaigner and global trade union adviser at AIUK) [pictured, wearing the high visibility jacket] spoke for ten minutes. The bill is, he says, "a fearsome attack on civil and human rights". Other speakers included Emma Hoddinott of UNISON [left], Rachael Maskell (Member of Parliament for the York Central constituency) [second from left] and Neil Foster (Trades Union Congress Policy & Campaigns Officer for the Northern, Yorkshire & Humber regions) [right].